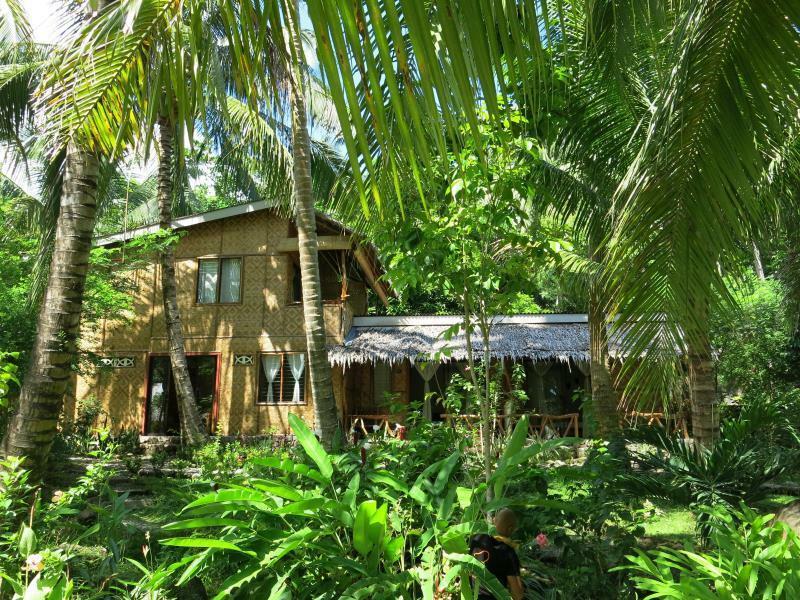 "This is a beautiful property with sweeping ocean views and a..."
Have a question for Camiguin Volcan Beach Eco Retreat and Dive Resort? "Easy access as it is located in the main road." "The rooms are perfect and the staff is very helpful." "The food was very good and unique dishes." 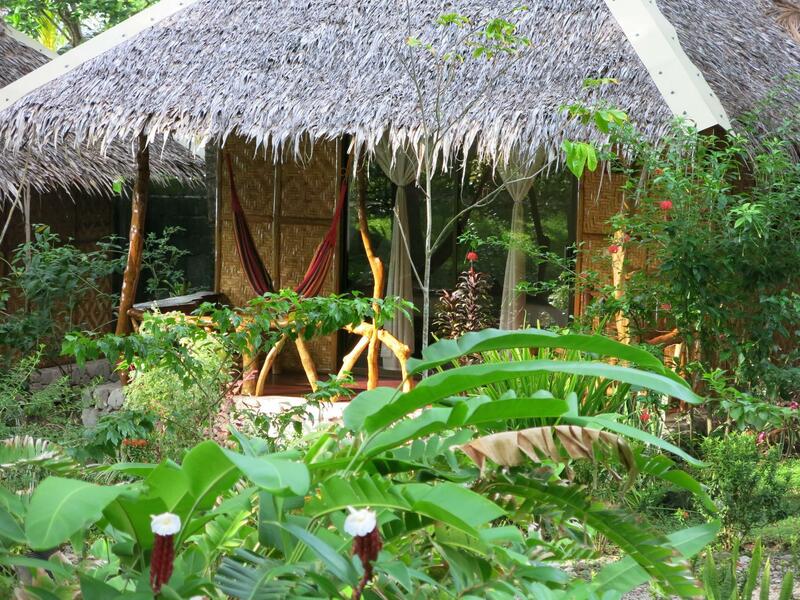 "Vulcan Eco Resort was lovely, friendly, clean and welcoming." 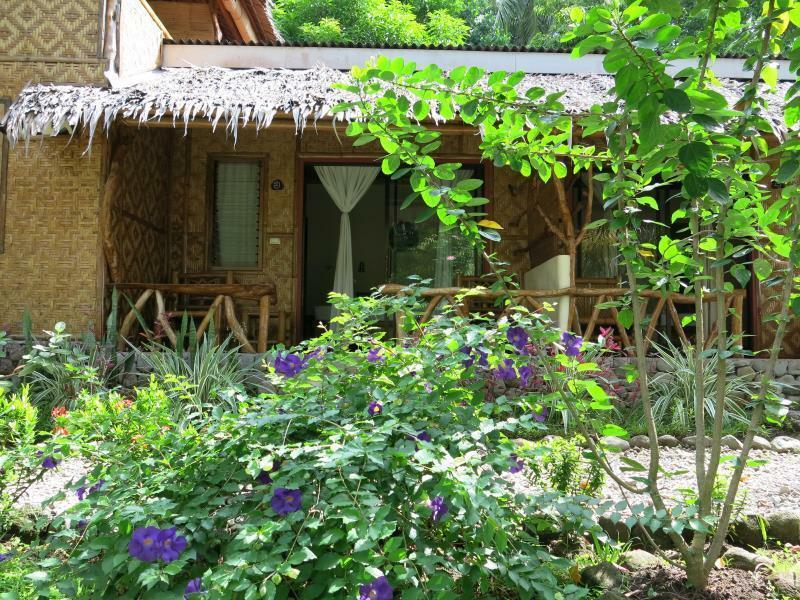 Nestled in the heart of Mambajao (Camiguin), Camiguin Volcan Beach Eco Retreat and Dive Resort is an ideal spot from which to discover Camiguin. The hotel is not too far from the city center: just 9.0 Km away, and it normally takes about 15 minutes to reach the airport. Visitors to the hotel can take pleasure in touring the city's top attractions: The Sunken Cemetery, White Island, Camiguin Airport. 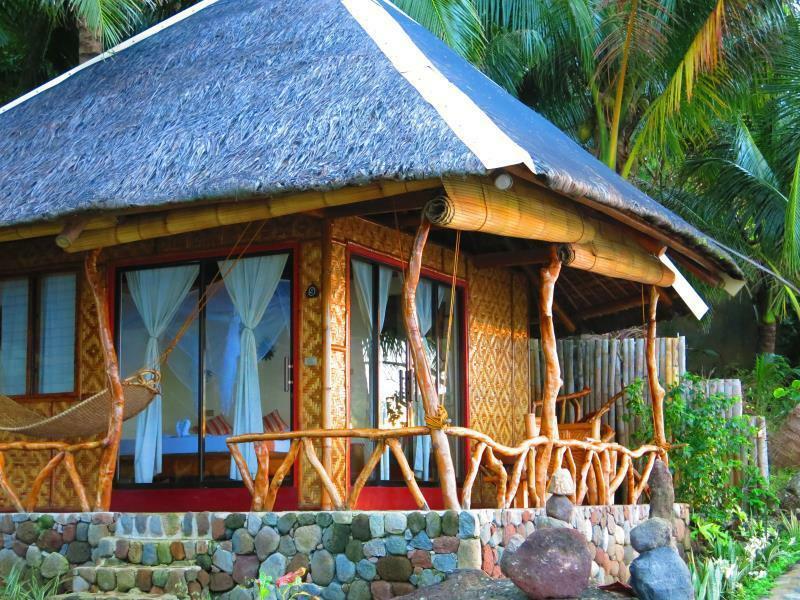 Take advantage of a wealth of unrivaled services and amenities at this Camiguin hotel. This hotel offers numerous on-site facilities to satisfy even the most discerning guest. 15 rooms spread over floors provide a warm and pleasant home away from home. Modern comforts such as internet access – wireless, internet access – wireless (complimentary), non smoking rooms, air conditioning, wake-up service can be found in selected rooms. The hotel offers an excellent variety of recreational facilities, including watersports equipment rentals, yoga room, snorkeling, private beach, diving. 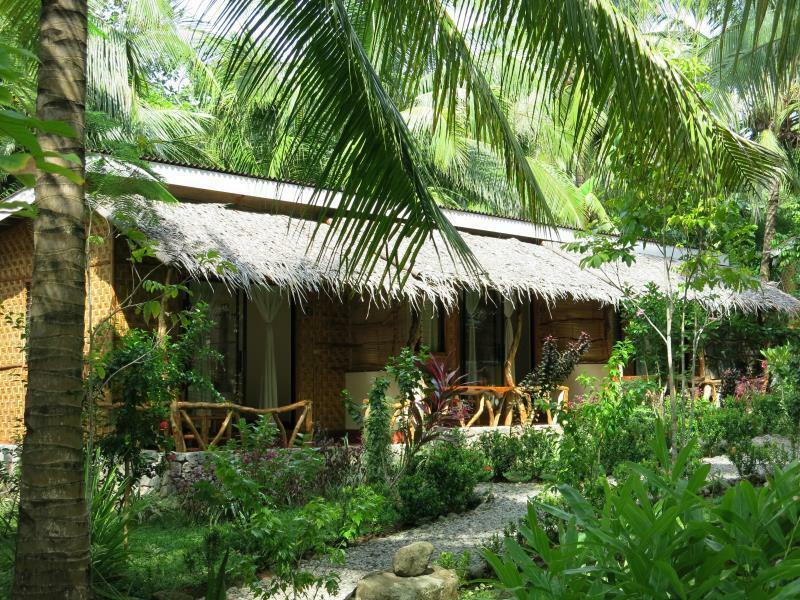 Camiguin Volcan Beach Eco Retreat and Dive Resort is your one-stop destination for quality hotel accommodations in Camiguin. 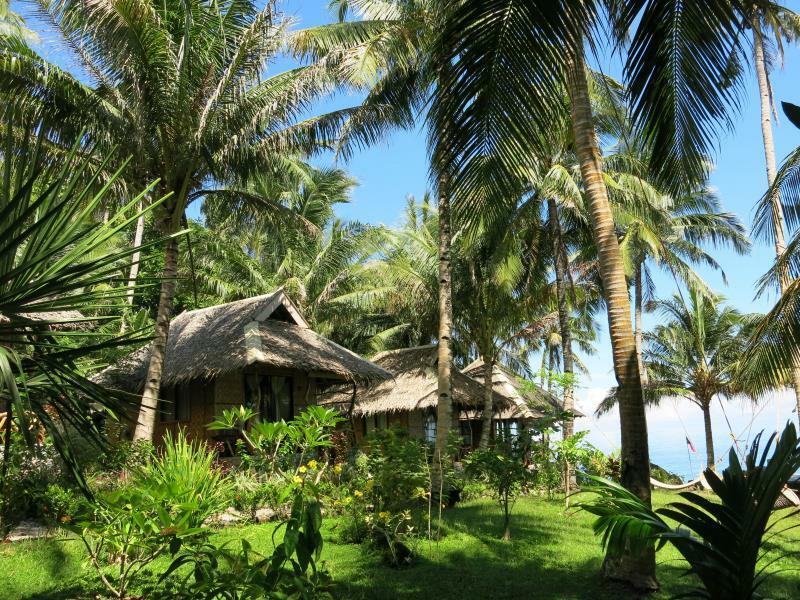 "Volcan Beach Resort is very green, very spacious resort with..."
As an expat living and working in Manila, I have found it difficult to travel within the Philippines. This all changed when I found Camiguin Island. Only two quick flights, a hotel pick up waiting for me, and I was there! Vulcan Eco Resort was lovely, friendly, clean and welcoming. The room was perfect for relaxing and freshening up. My friend and I had an AC room, but probably would have been OK with a fan room. We both loved the hammocks that were spread throughout the property, and we especially loved the sunset views. The staff were welcoming, accommodating, and friendly. The owners and managers (both German) were lovely and very helpful. The food was "OK" but I loved the home made bread and juices! If you are looking for a place to un-wind, relax and get off the beaten path I highly recommend Vulcan Eco Resort. *Wifi is spotty at best, but bear in mind this island is still developing. That is WHY I loved it! I needed to unplug and just be. This is a beautiful property with sweeping ocean views and amazing sunsets! Consider it more like upscale camping in the sense that you have an open-air bungalow without AC and the need for mosquito nets at night. The cafe was nice to have and it's the only spot where the wifi has a chance to work, if you need that sort of thing. Would have liked to have coffee options before 7:00 am. Great place for those who can get along without creature comforts. Volcan Beach Resort is very green, very spacious resort with the stunning view of the ocean. The rooms are big enough, with nice veranda. Very good location. The staff is very kind and helpful, food is very tasty. This place is perfectly nestled away from the main town, and if you don’t mind having intermittent signal on your phone you have the comfort of your room steps away from the best forest/garden mix and some spectacular sunsets, and a quiet snorkelling spot. We enjoyed the good food and the very friendly, attentive and helpful staffs. For sure you can find cheaper places on Camiguin, but for us the whole package of sightseeing tours, hiking tours, very good food and a beautiful place to stay was more than worth it. We chose this place for the diving but found a beautiful place by the sea! We stayed in the cottage with almost 360 view of the ocean for first 3 days and moved to air-conditioned cottage for 2 nights since the beach cottage was already booked. Both rooms were comfortable and clean. You don't really need the beach cottage (only 2 available) to enjoy the view, plenty of places to hang out by the water and plenty of hammocks. We really enjoyed the stay and particularly the diving. Beautiful diving site in Mantigue Island. Only problem was sparse internet connection throughout our stay, but we did not go there for the internet! The place is spectacular! It is in itself a view! We booked a beach cottage and it exceeded our expectations as it is really nice and cozy and island-y. Curtains are so dreamy, as well as the mosquito net on the bed. Haha. The food, we didnt try. Network reception is zero, but that, we already expected since we read the reviews. The staff and the owners are nice and accommodating! The place could use some lights at night, maybe even a spotlight in one of the palm trees where the hammocks are tied. The view in their sundeck during sunset is the best in the island, I think. Was able to do a time lapse video of the sun setting! P.S. The place is so nice that we opted to skip our tour in White Island to lounge in our cottage and take some pics of the place. No regrets. I would have rated it 5 of 5. Let me say that this resort is amazingly peaceful and beautiful. We booked an AC room with veranda, and it was great! The bamboo dock by the rocky shore is a place to be during sunset. Food selection is expensive and limited, though. Customer service is surprisingly good! The only BIG setback is their imposition of a 6% service charge for bills paid via credit card. THIS PRACTICE IS ILLEGAL IN THE PHILIPPINES. I will give the resort management 7 days to contact me and appease me before I file a formal complaint to the Department of Trade and Industry. Thanks! This place is amazing. The setting is so relaxed and beautiful. The staff are really friendly and helpful. The owners go out of their way to make your stay pleasant and the trips I organised were very good. Already planning when I can come back to this amazing island and retreat. The resort owners and their staff. The beach front villas. The beautiful gardens. We had researched our stay checking on all the different resorts available: appearance, location, rating and comments. Volcan was the best rated with the best comments. Needless to say we enjoyed our stay from the beginning to end of our 7 day vacation. We took almost all our meals there and regreted the only two we did not take at the resort. The restaurant serves European Asian fusion, the service is always impeccable and friendly. The staff go out of their way to help you. We went diving with the resorts diving instructor, Sylvia, just in front of the resort, she was also our guide for a trek to the rainbow falls, a hike to a secret mountain spring and guided us on the snorkelling expedition to Mantigue Island (incredibly beautiful). They are without a doubt the number 1 resort in Camiguin. A fairly new (6 months, as of Oct 2013) resort run by a friendly German couple. It's actually not really a resort, per se, as it doesn't have a beach, pool, gym, tennis, golf, and the like. It's a very well-designed collection of charming cabins with a good restaurant/bar. They do have a dive center, but we only checked out the snorkel gear, which was fine. You can snorkel off their rock waterfront but you have to get in the car to find a white sand beach (just a few minutes away--Camiguin is not a big place). The hosts were very helpful with finding places to go--they have lived here seven years. Great place to disappear with a lover for quiet time and good food. The Resort is located five to ten minutes from Mambajao, the center of Camiguin, where numerous restaurants and souvenir shops can be found. It is also near the Sunken Cemetery, Walkway to the Old Volcano, Gui-ob Church Ruins and the jump-off point to the White Island. We were informed that the hotel started operations only in Jan. 2013, which meant that everything was new. Upon arriving, we were greeted by the German owner who manages the place. I admire her hospitality as she made us fell very welcome. She expedited our check-in and instructed her assistant to carry our bags. We booked an Ocean View Villa. There were only two in the whole resort, which meant that it was also the most expensive. But I must say that it is well worth the price! We were greeted by a lovely view of the Bohol Sea, which can be seen from any part of room due to huge floor-to-ceiling glass panels. The villa also had its own private terrace with a hammock and a sitting area where guests can enjoy the view of the sunset over a cup of hot chocolate and some Vjandep Pastel. Take note that the villa is not air-conditioned. We were hesitant at first, but it was probably the best decision we made! The eaves of the villa were open. Hence, the sound of the waves hitting against the rocks became our night's lullaby and the ocean breeze relieved us of the city stress. For the record, it was chilly especially at night! The four-poster bed had nets, which not only repelled insects but added to the romantic atmosphere of the place. And the bamboo shades and linen curtains ensured ample privacy. The restaurant serves a mix of Western and local dishes. Although quite expensive, the servings were good for two. The restaurant also has a bar where guests can lounge about. It is a good place to interact with others and is conducive to chill the night away. Overall, our experience there definitely made our Camiguin trip a really memorable one. I already miss the place! warm welcome by the management who can organize activities for you; quiet place overlooking the wide ocean ; hammocks in the garden; family atmosphere (contacts easy with other guests); wifi but in the lobby area only (would be a plus if available in the rooms); very good souvenir of my stay in this place ! I really liked my stay in Camiguin. So much so I extended the stay for an extra two nights. The resort is very new (built 2012), so everything is clean and tidy. There are great ocean views, and the cottages are set in a nice landscaped garden. The owners and staff were really nice - especially helpful during the busy Easter week. I really enjoyed staying here. We got a cottage with AC which was good. The bed in the room I was in was big and I really liked that. They have a clean bathroom but it could use some more light at the shower area. I really feel like it's an eco resort since there's only a few cottages, i.e. few guests. The place is really tranquil and all you can hear are the sea waves. The area where the resort's in, in Camiguin has no reception for Globe. The only means of connecting to the worldwide web is through their WiFi which is only accessible at their bar area. It would have been better if each room had their respective routers. Actually, the WiFi connection at the bar itself was really slow and it was futile to connect. This is the reason why I said this is the perfect place if you want to feel detached and just relax. The place was alright. I made the mistake of getting the villa because there was no AC or proper coverage from the bugs and lizards. Although, me and my fiancé made it work even with just an electric fan. The filipina staff were very good to us.. in my opinion, they made the place bearable for us. As long as you were nice to them. The view was magnificent, even though it wasn’t always sunny when we were there. All in all, the place was good but a bit expensive; they try to make up with the scenery and the relaxing vibe of the place. We came to Camiguin so that our adult sons could take the the open water diving course. Since their in house instructor was away, Gabriel and Sabine brought in Mina from Bahol just for us. She was there when we arrived, so the boys could start the course right away. Mina and our family really bonded, we talk each night on instagram since leaving. Each day Gabriel helped us plan some new adventure. Don’t miss Mantigue Island or the drive through the virgin forested mountains. The villas are fantastic with views of the ocean and beautiful garden. The restaurant has a great selection of Asian and European cuisine, and the dinner menu changes nightly. Everything was fresh and delicious. Even the bread is baked right there. We had a wonderful time and highly recommend Volcan Beach Eco Retreat and Dive Resort. No Internet, No Mobile Signal, worst is No public Transport. Very dark in the evening also the Road since it’s at the end part and no people wanna go. Management has serious bad Attitude. Photos looks nice since edited but not completely the same.if your Filipino better stay away from this since the owners doesn’t have the heart of Pilipino.